Recently the University of Michigan announced its operating budget for 2018. Normally a red-blooded Buckeye wouldn’t pay attention to anything having to do with That School Up North, but in this case we’ll make an exception, because the operating budget included information about how much money TSUN expects to receive from the Big Ten as its conference revenue distribution next year. And the projected revenue number (drum roll, please) is: $51.1 million. That $51.1 million in expected revenue distribution will go not only to the despised Maize and Blue, but also to the good guys in Scarlet and Gray and all of the other schools in the 14-member Big Ten Conference. Do the math, and you will quickly determine that the Big Ten will be dishing out more than $700 million to the schools that are lucky enough to be part of the Old Conference in 2018. Say, do you think the school administrators and athletic directors at Rutgers and Maryland are happy about their decision to join the Big Ten back in 2014? The story linked above says the big driver of the Big Ten’s enormous projected 2018 distribution is TV revenue. The Big Ten’s TV deal is expected to produce $2.6 billion in revenue over six years, generating lots of money to dole out to Big Ten members. The Conference has been pretty far-sighted in maximizing its TV revenue, having created its own network before other conferences did and driving a hard bargain in its negotiations with networks. The Big Ten has two aces in the hole that give it incredible leverage: huge schools with lots of graduates and supporters who are spread out around the country, are passionate about sports (primarily football), and want to watch their team play every weekend during the fall, and a conference that now stretches from Nebraska all the way east to New Jersey and Maryland, covering many of the biggest media markets in the country. The $51.1 million in projected Big Ten revenue for 2018 is just each member school’s share of the Big Ten’s common revenue. 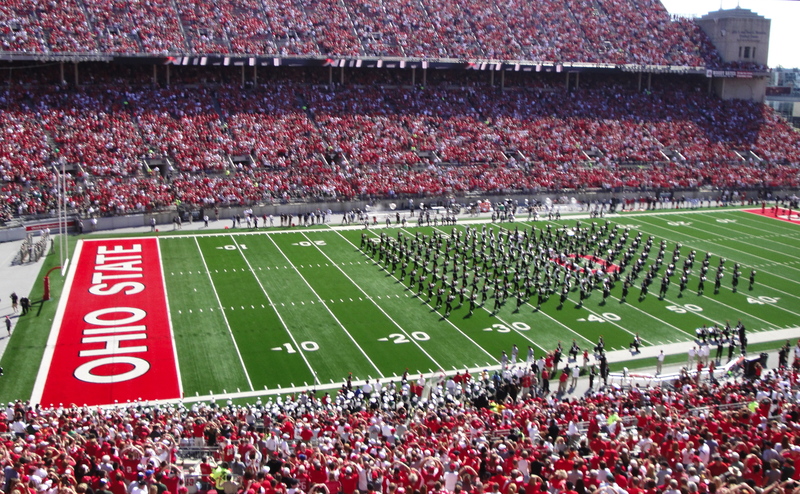 The powerhouse schools like Ohio State, Michigan, Penn State, and Michigan State also generate lots of cash from their individual merchandising, licensing and “partnering” deals. Those schools know that their fans want to wear their school’s gear and put up school merchandise in their dens and family rooms and “man caves,” and they’ve got prized brands that also contribute lots of dough to the bottom line. We’ve reached the point where educational institutions have developed, and now own, some of the most valuable brands, logos, and mascots in U.S. commerce. In the largely midwestern footprint of the Big Ten, football is a cash cow that produces lots of moola. The Big Ten Conference and its member schools are milking that cow for all it’s worth. Tomorrow is The Game. 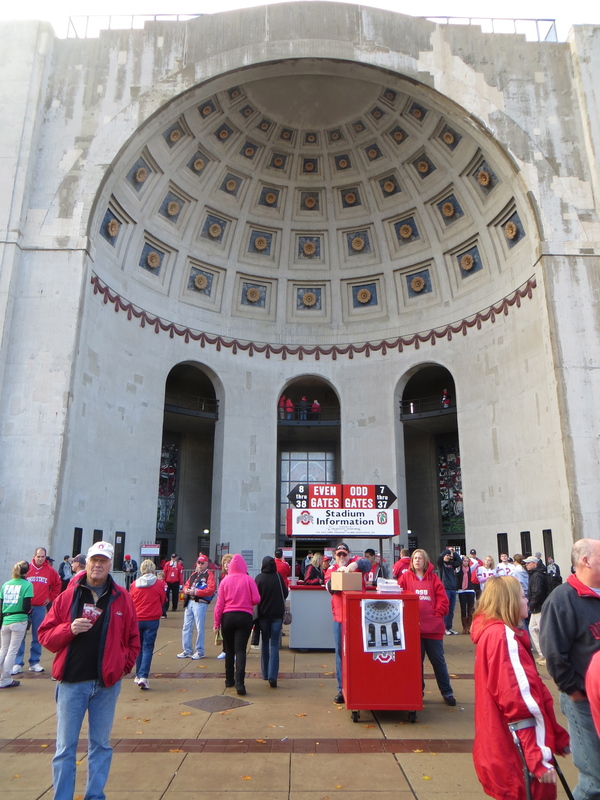 I’ll be there, sitting in the Horseshoe in Section 12A. The game will have the traditional noon start and the weather will be crisp and cold, with highs in the 30s and lows in the 20s. Other than the start time and the weather, I don’t think there is much that is predictable about this edition of The Game. Michigan has a great offensive player in lightning quick QB Denard Robinson, who is rewriting the Michigan record books. Robinson is easily the most explosive offensive player that Buckeyes will have faced so far this year. With Robinson at the helm, the Wolverines have scored points in bunches. Michigan’s offense will pose tremendous challenges for the Ohio State defense. No team that has faced Michigan so far this year has shut down the offense, and I don’t expect the Buckeyes to do so, either. On the other side of the ball, it is fair to say that the 2010 Michigan defense is not very good. 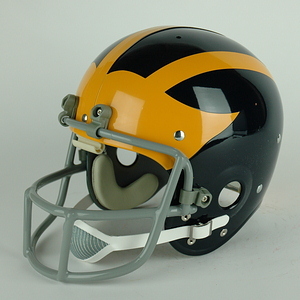 In fact, for those of us who grew up with the rivalry in the ’70s when Michigan always fielded a stout, hard-hitting defense, Michigan’s current defense is virtually unrecognizable. The 2010 Wolverines have given up an average of more than 39 points per game in Big Ten play and have — statistically, at least — one of the worst defenses in college football. In last week’s Michigan loss, Wisconsin ran the ball again, and again, and again, and Michigan simply could not stop them. You have to think that Ohio State will be able to move the ball and put points on the board. There is a lot to worry about in this game. Teams that can score always have a shot at an upset; if Ohio State gets sloppy and puts the ball on the ground or wastes scoring opportunities, Michigan could get ahead and stay ahead. Although Ohio State is a prohibitive favorite, this rivalry has seen lots of upsets over the years, and Michigan may be due. The Wolverines have lost six in a row to the Buckeyes, and must be wondering whether a loss tomorrow would cost head coach Rich Rodriguez his job. Let’s hope that this year isn’t the year the Wolverines break the streak. Breaking news: the Ann Arbor, Michigan City Council has finally — finally! — acted to ban porch couches. Thank God! Resolute action on this crucial issue is long overdue. For years, Americans in countless college towns have had to live with the threat of beer-soaked couches serving as the breeding grounds for new forms of bacteria and potential pestilence, of diligent students being overcome by noxious fumes emanating from the mildewed orange artificial fibers on exposed and threadbare sofa armrests, and of the traffic hazards posed by chunks of styrofoam pulled from the burst sides of cheap cushions rolling through the city like sagebrush tumbling through the dusty streets of Laredo. Now we can only hope that local government officials in college towns will turn to other weighty matters, like cracking down on the appearance of troubling garden gnomes and the sale of cheap foreign-made Che Guevara t-shirts that shrink five sizes after just one washing. Of course, you would expect that far-sighted public servants in a town like Ann Arbor would take the lead on the pressing topic of outdoor davenport regulation. The only weird thing is that one of the big safety concerns with college porch couches is that excited students might set the furniture ablaze after a big home team sports win. Why would Ann Arbor council members have any concerns on that score? I’ve posted before on the potential NCAA violations committed by the Michigan football program, which initially were reported by the Detroit Free Press. Some nine months later, Michigan has now completed its “internal investigation” and admitted to certain violations. It concluded that there was a breakdown in communications and it fired one staffer and reprimanded seven other people involved in the football program, including Head Coach Rich Rodriguez. It also put itself on two years of probation (although not of the double-secret variety). The school clearly hopes that its self-administered punishment will cause the NCAA to refrain from imposing other tougher sanctions that further sully Michigan’s reputation. It’s hard to believe it took nine months for Michigan to figure out that there was a breakdown in communications, but it doesn’t surprise me that Michigan didn’t ultimately hold Rich Rod accountable for the failings in his program. Michigan took a big risk in hiring Rodriguez rather than a “Michigan man,” and so far it has been an embarrassment and a disaster for one of the most storied, respected programs in college football. The team has been terrible, players have transferred and raised questions about Rodriguez, and scandals like the Free Press articles seem to be lurking around every corner. Let’s hope Michigan has fixed those communications breakdowns and established appropriate supervision over its football program, because Rodriguez surely understands that if the Wolverines don’t win this season he is gone. Coaches whose jobs are hanging by a thread often are more attentive to wins than compliance. The BBC reports that studies have indicated that populations of wolverines in North America are declining. 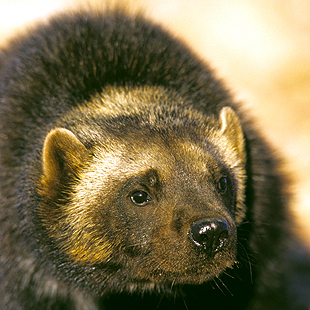 Wolverines are the largest members of the weasel family, live in remote northern areas, and eat the remains of large animals and smaller animals, like rats, that the wolverines hunt themselves. The scientists quoted in the article link the decline in the wolverine population to diminished snowpacks in the wolverines’ natural habitats, which they surmise would reduce the food supply for wolverines. The scientists apparently didn’t address the possibility that the carrion-consuming, rat-eating wolverines are dying of embarrassment because they are the unfortunate mascots of the recently underachieving University of Michigan sports teams.